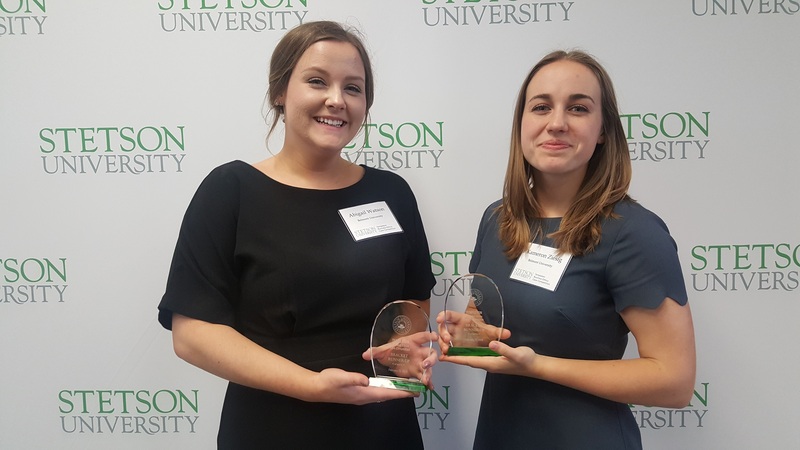 Belmont students from the Jack C. Massey College of Business recently competed in the Templeton-Stetson Ethics Case Competition, tying for fifth place among 21 teams. Team members included Abbey Watson, Kameron Ziesig, Matt Lay, Brenna Joslin and Zach DiGregorio. The case topic was “Gender Quotas for Corporate Boards: Appropriate Affirmative Action or Unnecessary Intrusion into Business Autonomy?” The two day competition held in DeLand, Florida included Georgetown, Clemson, Penn State University, University of Massachusetts-Amherst, Wake Forest, Elon University, LaSalle University and University of Calgary, among others. The team is sponsored by the Edward C. Kennedy Center for Business Ethics. Center Director and Professor of Practice Boyd Smith, along with Dr. Jennifer Fowler, associate dean of the Massey Graduate School of Business and associate professor of economics, served as team coaches.